All the info you may need to plan a successful stay in Bracciano. Book your tickets for top activities and tour in Italy and around the world. 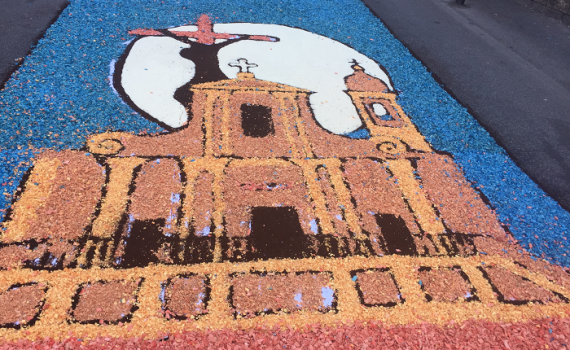 If you are interested in flour artworks and are near Rome, come to Bracciano on Sunday, June 3 to assist to the Infiorata festival, during Corpus Domini celebrations. Both events are felt by the Bracciano's community and attract tourists and curious from all over Italy. They are promoted by Rione Borgo di Bracciano and the inter-parish community of Bracciano, including the Parish of St. Stephen PM. Corpus Domini is the celebration of the sacrament of the Eucharist, instituted by Jesus during the Last Supper, since the thirteenth century. It occurs sixty days after Easter Sunday, the Sunday following the anniversary of the Trinity. 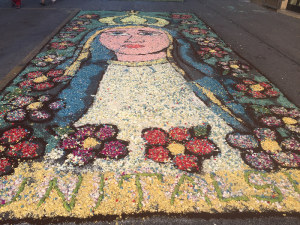 Between May and June many Italian towns celebrate Infiorata Festival decorating their historic city center with terrific flower artworks, made by beautiful petal carpets varying from simple geometric designs to elaborate tapestries, all inspired by religious art and famous paintings. To create these wonderful carpets, the design is first delineate in chalk on the street, and then filled in with thousands of petals of various colors. All the Infiorata process usually takes two or three days to be completed. This tradition was born in the seventeenth century as an imitation of the famous Vatican Mosaics. Performing such difficult job requires special skills such as selection and collection of petals, as well as competence in drawing on the ground. Do not miss watching the artists as they give rise to their masterpieces. Even children will appreciate these particular skills and abilities. The celebration of Corpus Domini starts at 6:50 PM from the Santo Stefano Cathedral and ends in front of the Divino Amore Church, following this itinerary: via della Collegiata, via Umberto I, piazza 1 ° Maggio, via Principe di Napoli, piazza IV Novembre, via Trento, via Fausti, and finally via Negretti. You will see all the stunning artworks created by expert artists and designers, along the way, through the streets of the historic center. How to reach Bracciano click here.